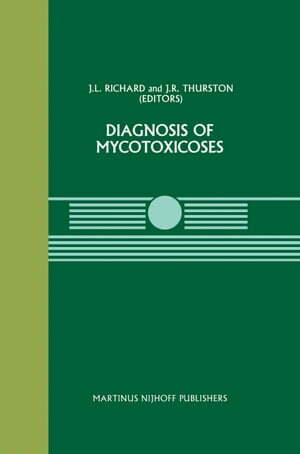 Collins Booksellers - Diagnosis of Mycotoxicoses by J.L. Richard & J.R. Thurston, 9789400942356. Buy this book online. Current problems associated with the mycotoxicoses include the recognition of an animal disease as being a mycotoxicosis and confirmation of diagnosis of the mycotoxicosis by satisfactory laboratory methods. By gathering a vast amount of scientific literature, diagnosticians can provide themselves with suitable informa­ tion for making such a diagnosis. However, the increased number of reported intoxications caused by fungi, the wide range in diversity of disease conditions and the chemical compounds causing the mycotoxicoses, and the ever-changing and rapid developments in the technology of mycotoxin analysis has made the gathering and assimilation of sufficient information by the diagnostician an insurmountable task. This is the reason for development of the symposium and the publication of this book; the first time that the subject of diagnosis of mycotoxicoses has been assembled in a single publication and as a compilation of topic papers by experts in this subject area. The UJNR panel on toxic microorganisms is interested in all aspects of intox­ ications by microorganisms as evidenced by its annual joint meetings in either the United States or Japan and its involvement in sponsoring numerous symposia and several publications in this broad scientific area. The overall mission of the National Animal Disease Center includes research efforts in the improvement or establishment of diagnostic methods for animal diseases. The UJNR panel and the NADC provided the funds and encouragement for the development of a symposium on the diagnosis of mycotoxicoses in the United States and . Tapan.